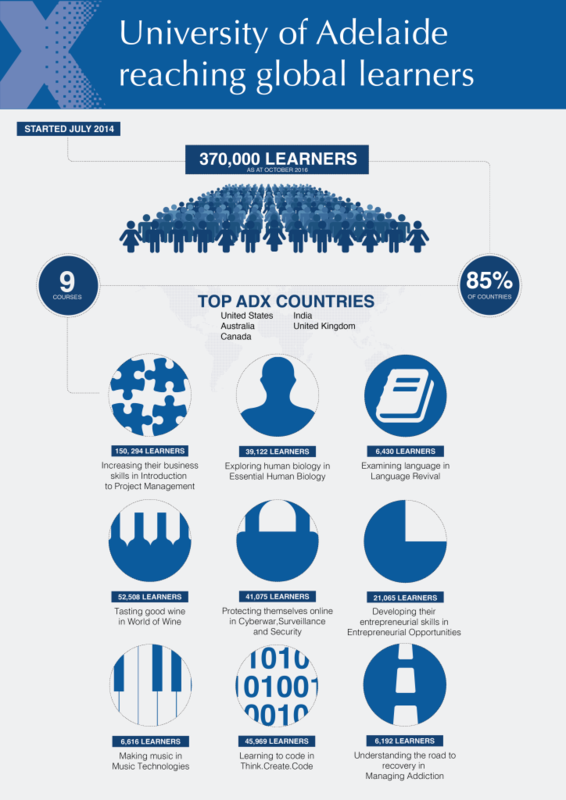 AdelaideX, the massive open online course (MOOC) division of the University of Adelaide, has the capability for global reach and since its launch just over 2 years ago, has engaged over 370 000 learners from 85% of countries around the world. Of the nine courses launched so far, seven have relaunched new instances and are now available as self-paced and a tenth course – Introduction to Data Structures – is open for registrations and launches on 18 January 2016. Here’s how AdelaideX has impacted on learners globally. This entry was posted in Uncategorized and tagged Blended learning, global learners, MOOCs, online, online courses, Open learning. Bookmark the permalink.